All Pipelines have a Triage stage by default. Learn how it works. We have made some changes to Pipelines to make them easier to use in general, and to help improve the mobile experience. 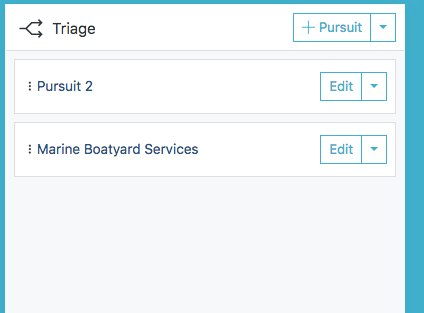 You can now add new Pursuits to your Pipelines in one click, thanks to the addition of Pipeline Triage. This short video demonstrates and discusses how Pipeline Triage works. A written walkthrough with screenshots is also included below. Triage exists as a default stage in all Pipelines. When visible, it is always shown as the first, far left stage. You are able to hide the Triage stage, if you wish, by clicking the Hide Triage button at the top of your Pipeline. The Triage button also displays the number of Pursuits that are currently in Triage. The purpose of Triage is to serve as a staging ground for all newly identified opportunities. 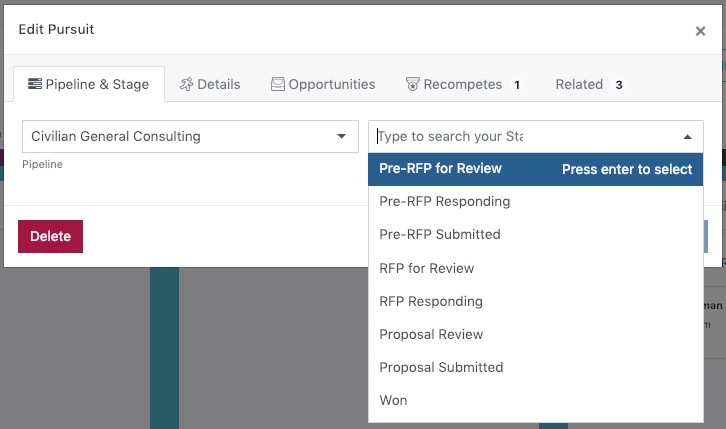 Having a Triage stage allows you to add new opportunities to a Pipeline in one click. Just look for the Add to Pipeline button on any Opportunity or Award page on GovTribe. 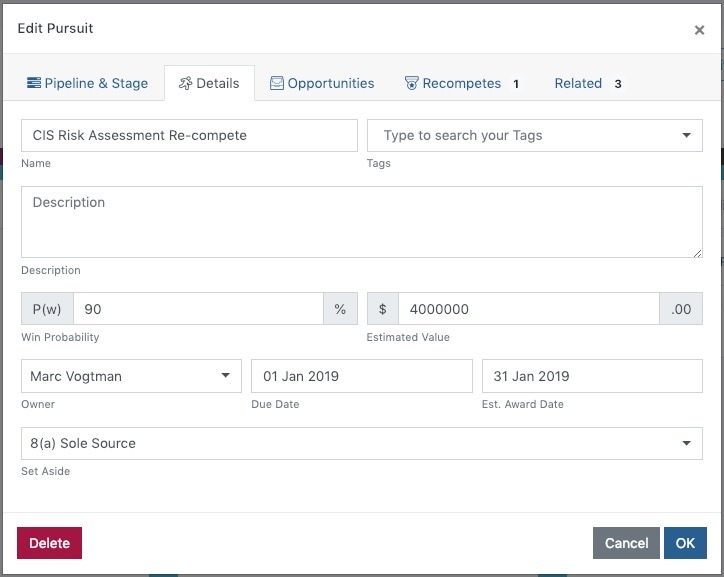 Click Add to Pipeline, select the PIpeline you wish to add it to, and a new Pursuit based on that Opportunity or Award will be added to the Triage stage of your Pipeline. Pursuits in Triage do not affect your Pipeline's stats or projections, and you are not required to fill in any details for Pursuits in Triage. However, you will receive email notifications about updates from the government on any Pursuits in Triage, just as you would for Pursuits in any other stage of your Pipeline. You can move a Pursuit out of Triage in the same manner as you would otherwise move Pursuits between stages. With your cursor, click and hold on the three vertical dots on the Pursuit card that is sitting in Triage. Then drag the Pursuit to the stage you want to move it to. As such, we recommend that you now add some additional information to your Pursuit that will make your Pipeline reporting more meaningful. To do this, click the Edit button on the Pursuit. You will be presented with a pop-up modal containing several tabs. By default, it will first show you the Details Tab. The Details tab of the Edit Pursuit modal allows you to enter key information about the opportunity you are pursuing. You can modify the name of the Pursuit and add a Description, if you wish. Due Date - Due date for the response. Usually filled in automatically by the Opportunity. Estimated Award Date - Your estimate of when an award will be made. These four values drive all of your Pipeline performance stats. Though they are not required fields, keeping them up to date will allow you to better forecast your current and future performance. Once you click OK you will be redirected to the new Pursuit page. If you need to move a Pursuit from one Pipeline to another, you can also do that from the Edit Pursuit modal. Click on the Pipeline & Stage tab to view the current Pipeline and Stage for the Pursuit. Select a new Pipeline from the drop-down list on the left, and then select a Stage. Then click the OK button to save your changes and move the Pursuit.